Looking east toward PSU Urban Plaza from SW Montgomery. Portlanders are still coming to grips with the traffic violence experienced downtown on Friday. While details about 61-year-old Greg Porter continue to trickle out and the women he hit still recover at an area hospital, leaders in the transportation reform community are moving from grief and shock into action. The red x’s mark where victims were lying as they received medical attention. Just as we feared back in November after a similar tragedy took place in lower Manhattan; the horror of vehicular violence has come to Portland. 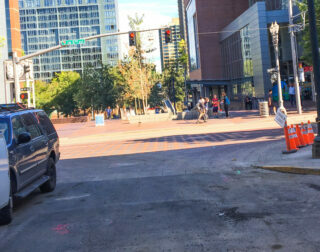 About an hour ago someone appears to have intentionally steered their SUV up a curb on SW 6th Avenue just before Montgomery and hit at least three women. Portland Police say two of them are being treated at OHSU with life-threatening injuries and the other one has serious injuries that are not expected to be life-threatening. A fourth person is believed to have been injured but left the scene and so far PPB have not been able to contact them. 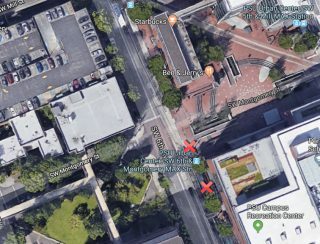 From media coverage we know that one of the victims was found right at the top of the ramp of the Portland State University Urban Plaza outside Cafe Yumm! and the Rec Center. Another victim was lying south of that near the transit stop outside the cafe. The driver fled the scene and police are on the hunt (they typically don’t update media with cases like this because they don’t want to tip off the suspect who might be watching the news). A man has been arrested and charged with four crimes in relation to a crash on April 6th that injured a bicycle rider. 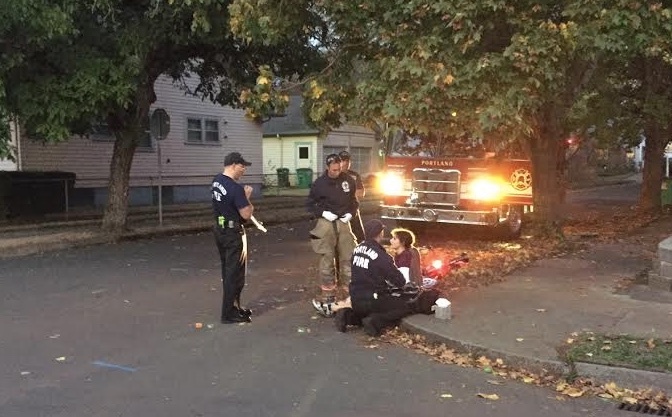 The Portland Police Bureau just announced they’ve arrested 30-year-old Abduraham S. Abubaker at his home (near SE Ramona and 122nd) for his role in a crash that took place on SE Gladstone at Cora just east of 34th last week. This section of Gladstone has two general vehicle lanes, unprotected bike lanes and a curbside lane. Police say witnesses who saw the crash said a man driving a blue Dodge Stratus turned south onto Cora from eastbound Gladstone “and collided with the bicyclist.” The driver then fled and left the injured bike rider in the roadway. The victim was helped by people who had gathered nearby. They contacted help, remained at the scene, and gave information to officers. Bike-cam footage nabbed this crazy driver seconds before impact. Watch the video below. 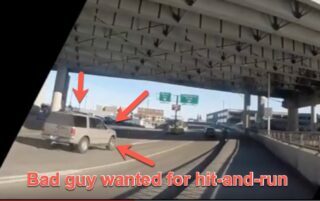 Portland Police are looking for a tan SUV after its driver was involved with a high-speed hit-and-run crash last month. 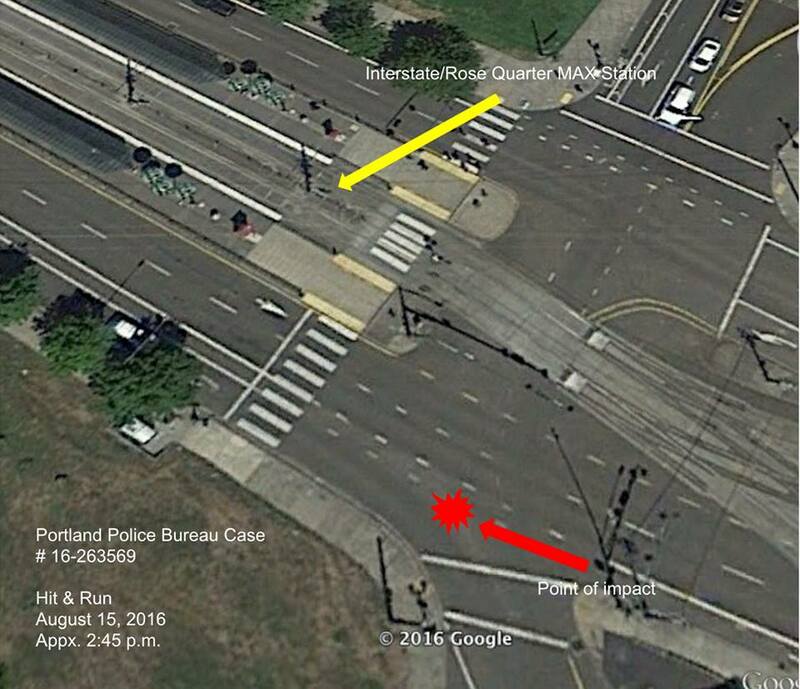 It happened about 2:30 pm on January 27th in the eastbound lanes of the Hawthorne Bridge just east of the Willamette River near the TriMet bus stop on the viaduct. Amazingly, so far the biggest lead the police have in the case is footage from a handlebar-mounted camera taken by a person who happened to be cycling nearby. Map of incident created by laywer Charley Gee. 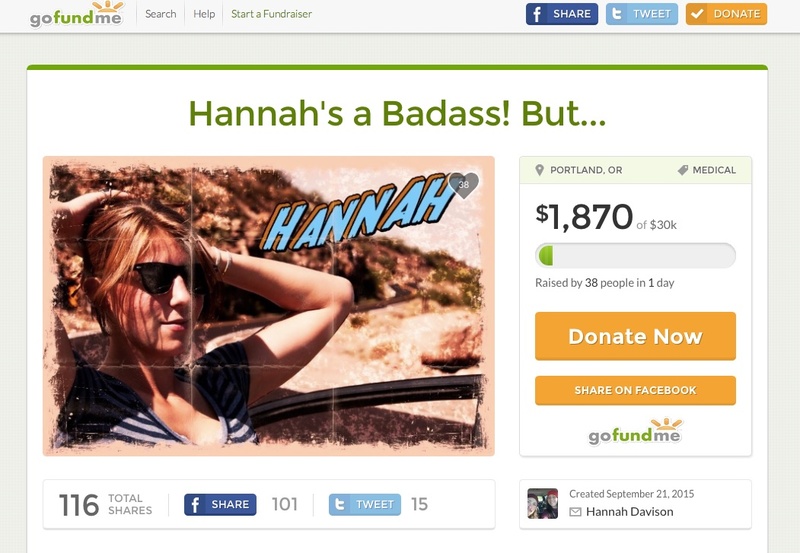 Portland-based lawyer and bicycle law specialist Charley Gee needs our help. 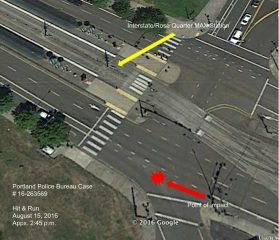 Gee represents a man who was struck by someone driving a car as he biked in the bike lane on North Interstate Avenue on August 15th. The person driving the car didn’t render aid or wait around for help to arrive at the scene. The victim needs information about the suspect to help his case. A case from Corvallis should send a shiver down the spine of anyone who uses our roads. As reported today by the Gazette Times, the Linn County District Attorney’s Office has decided to not file charges against the driver who hit and killed 34-year-old Shiloh Sundstrom while he was walking on the side of a road east of Corvallis on the night of November 22nd. The auto user admitted to drinking and looking down at his phone prior to the crash. Despite these facts, the Deputy DA Alex Olenick said the evidence wasn’t enough to prove the driver acted with criminal negligence. We’ve covered this legal situation numerous times and are aware of the existing limitations in Oregon law around traffic crashes. The threshold to prove intentional and reckless behavior by the driver of a car in situations like this is very high and often — even when it’s clear that a person’s behavior was dangerous and led to the crash — DA’s feel they must decline to prosecute. 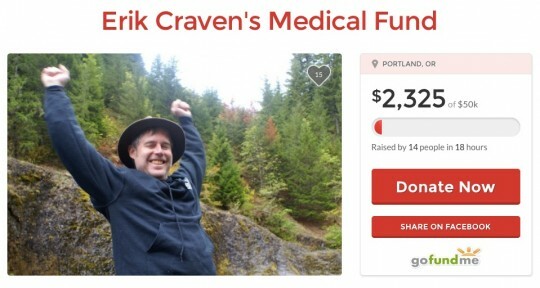 Fundraising has begun for Erik Craven. 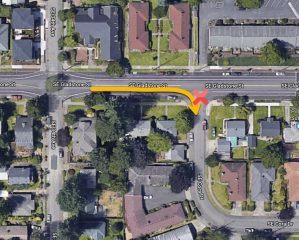 It happened at SE 59th and Powell this past Sunday night at around 11:30 pm. 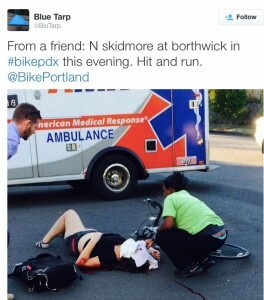 45-year-old southeast Portland resident Erik Craven was biking home from work when he was hit by a car. The person driving did not stop and has still not been found. Aleah Greene receiving treatment at the scene last night. Portlander Aleah Greene is recovering from her injuries after she was involved in a collision yesterday evening. “It all happened pretty quick. 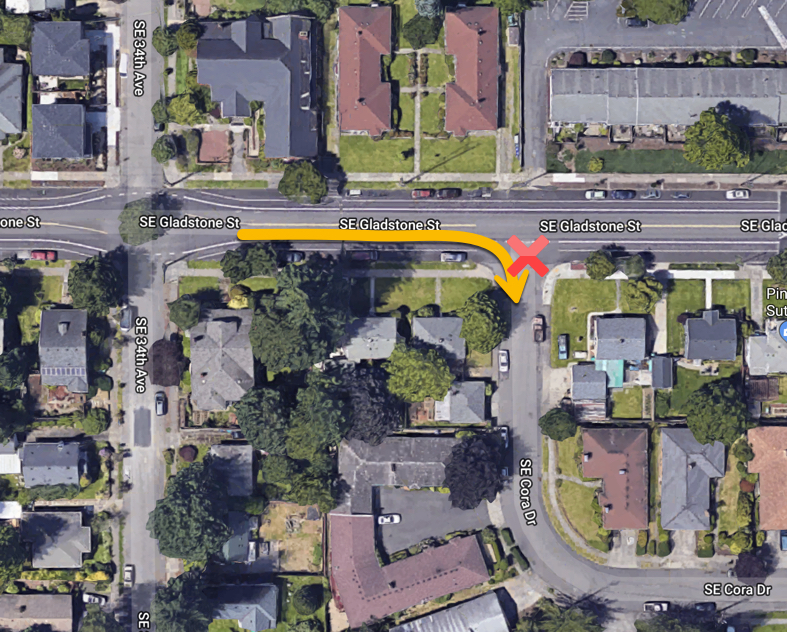 I was riding down 13th (helmet and lights on), when I got to the intersection of Wygant and started passing through I noticed the white van heading towards me was not stopping and was turning left into/in front of me. I don’t remember seeing a signal. We both had the right of way, no stop signs were run. He just didn’t see me is what he said. Screengrab from Hannah Davison’s GoFundMe page. Screenshot of tweet by @BluTarp. Portland Police are investigating a hit-and-run case after a woman was struck while bicycling on North Skidmore last night.